Authors Lori and Ava Ubowski, a mother-daughter team whose mother-daughter journal releases this week, lost their home and parish church (where Lori works) in Hurricane Michael. So, I am joining with other Catholic writers and bloggers to spread the word about their new book, Side by Side. 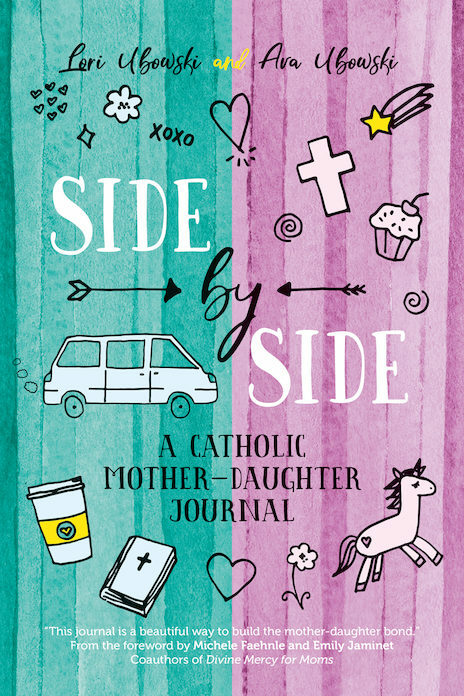 Side by Side: A Catholic Mother-Daughter Journal by Catholic musician Lori Ubowski and her daughter, Ava, is a unique journal that allows the two of you to communicate in a new and exciting way. Beautifully designed and rich in spiritual content, each page contains thought-provoking prompts that help you share your thoughts and faith while strengthening your connection with each other. 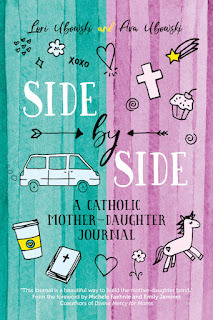 Side by Side is a unique gift journal that celebrates and invigorates the spiritual bond of mothers and daughters by focusing on important qualities and virtues in the lives of female saints and biblical figures that are essential to healthy relationships: kindness, honesty, courage, patience, openness, appreciation, and confidence. Stories of holy mothers and daughters from Church history provide additional opportunities for the two of you to share and pray together. Each page is designed to draw your hearts closer to each other with prompts such as Write about a time you were really proud of me or What is your biggest worry right now? This vibrantly designed journal is meant especially for mothers and their preteen daughters. Whether you work through the book from front to back or pick the chapters you like best, the two of you will begin a one-of-a-kind, private adventure. There is also ample space along the margins to sketch, color, or express yourselves in other creative ways.